“POUR” OVER THE PAGES. 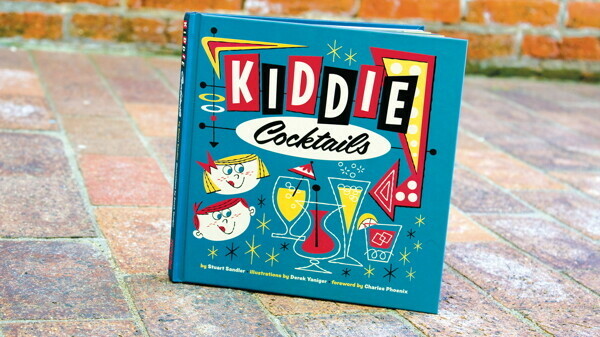 Kiddie Cocktails, written and designed by Stuart Sandler, illustrated by Derek Yaniger. Available at The Local Store, and online at www.KiddieCocktails.com. Eight ounces of ginger ale, half an ounce of grenadine, and a maraschino cherry – Shirley Temples have been the standard, beloved, and lone kiddie cocktail for many of us over the years. However, as demonstrated in the new book Kiddie Cocktails, the true possibilities for tasty, booze-free beverages are endless. From Eau Claire author and designer Stuart Sandler – with help from illustrator Derek Yaniger – comes this amazing book, which details fabulous drink recipes including classic cocktails, punchbowl concoctions, dessert drinks, and “kustom creations” – all of them non-alcoholic, imaginative, super fun, and accompanied by eye-popping illustrations. Any junior mixologist will have a blast mixing up this “sharp and tangy, smooth and sweet, fizzy but never flat, crisp and fruity, or rich and creamy” assortment of beverages. Not only are there plentiful recipes to choose from, but there are also tips on setting up a kiddie cocktail bar of your own and advice on choosing everything necessary to make your drinks as aesthetically pleasing as they are delicious. 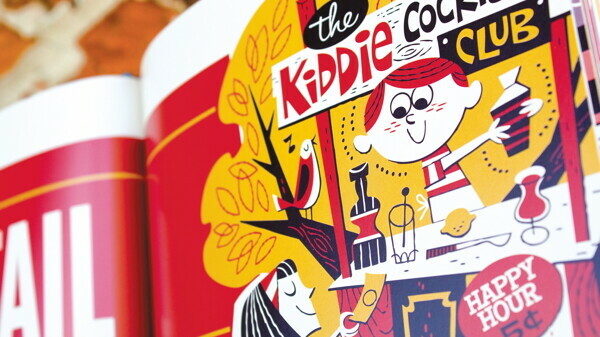 Kiddie Cocktails features Yaniger’s artwork and Sandler’s text and fonts. Inspired by 1930s-60s American pop culture, Sandler created a font design company, Font Diner, in 1996. 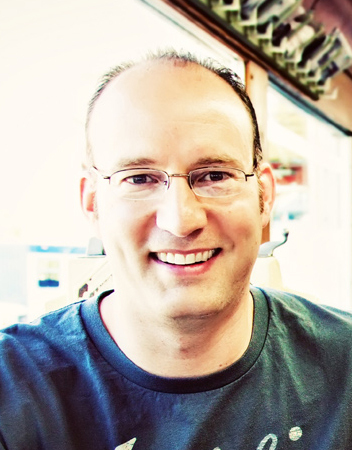 Then, in 2004, he founded Mister Retro, which offers retro graphic design software to complement the typefaces. Font Diner has created more than 500 original typefaces, and its original fonts are used exclusively throughout the book, as are Yaniger’s images, which are strongly influenced by the illustration styles and tiki culture of the 1950s. After an initial enthusiastic response by publishers, new projects and daily life led Sandler to sideline the concept. It was the formation of Mister Retro that brought Sandler and Yaniger together. As their business – and Yaniger’s popularity – grew, the two established a fruitful partnership. On one of their annual project meeting/planning days, Sandler recalled the book idea and asked Yaniger if he was interested and if he could contact a publisher he had worked with in the past to see if they were attracted. Sure enough, the publishing group Yak was very excited about the idea and wanted to see more. “I dug out my old dusty folder which contained some now very dated looking sketches,” Sandler recalls. “What was worst was that I couldn’t find a single digital file I’d created, so I was basically starting from scratch which turned out to be a blessing in disguise.” Sandler and Yaniger developed the concept enough for publishers to present at the London Book Fair, leading to a follow-up email that totally floored the duo. Not only had they gotten interest in the book, but they had managed to pre-sell a few thousand copies; it was production time. 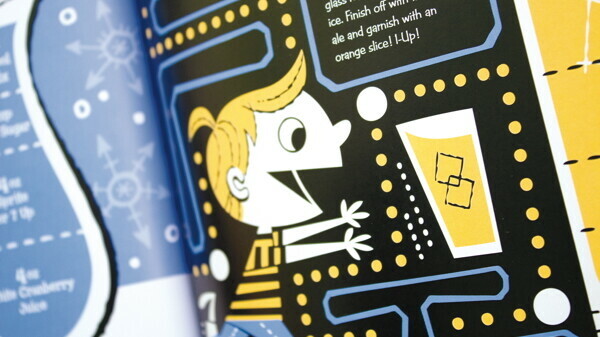 The team worked vigorously through 2013 and got the final pages to the publisher in January. Kiddie Cocktails definitely brings out a nostalgic vibe, but can certainly be enjoyed by people of all ages and even be used to bridge the generation gap. Some of the favorite beverages include The Lava Flow (strawberries, pineapple juice, cream of coconut, and light cream), the Nojito (soda water, simple syrup, lime juice, and mint leaves), and the Dreamsicle (orange sherbet, vanilla ice cream, and orange juice), and Sandler’s favorite: the classic New York Egg Cream, a combination of chocolate syrup, milk, and soda water. Try some tasty mixtures and meet the author at a book release party in the Volume One Gallery, 205 N. Dewey St., on Sat., June 7 at 11am. Visit kiddiecocktails.com for more.